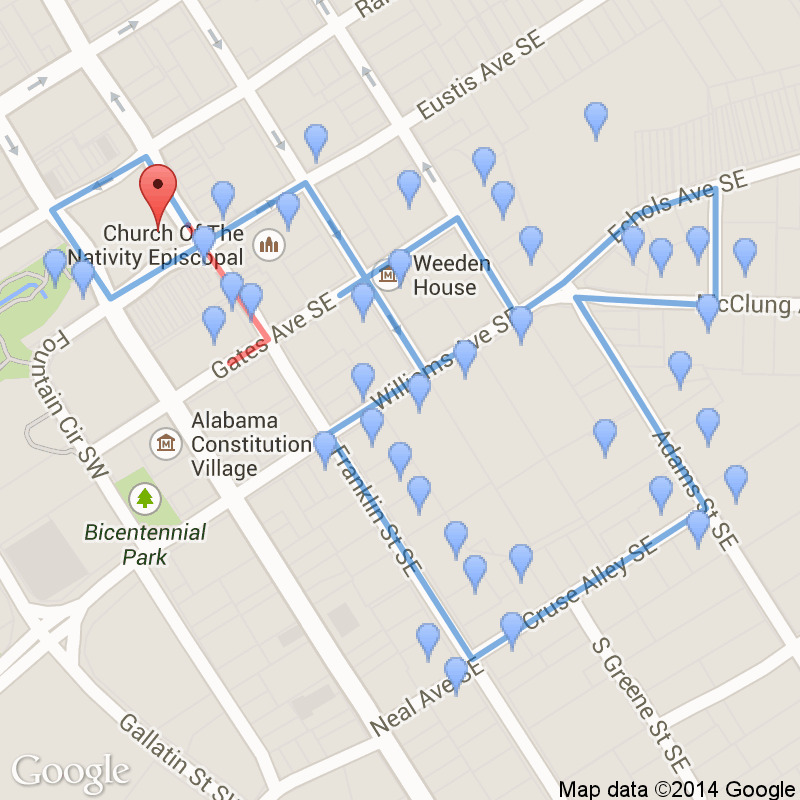 Continue straight on Franklin to South Side Square. Please watch for traffic as you cross South Side Square. 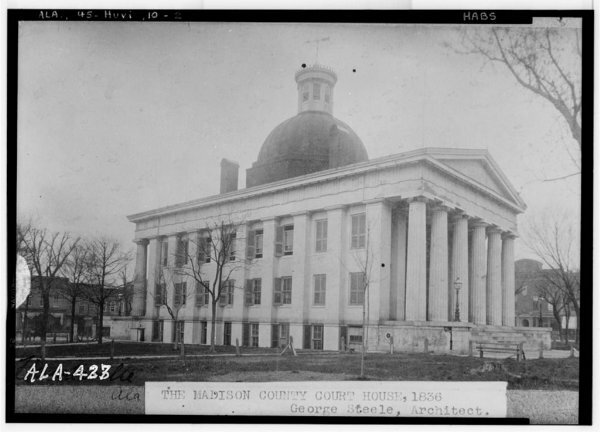 Listen to the tape as you circle the Courthouse Square. Stop when you reach the Bank Building on your right. 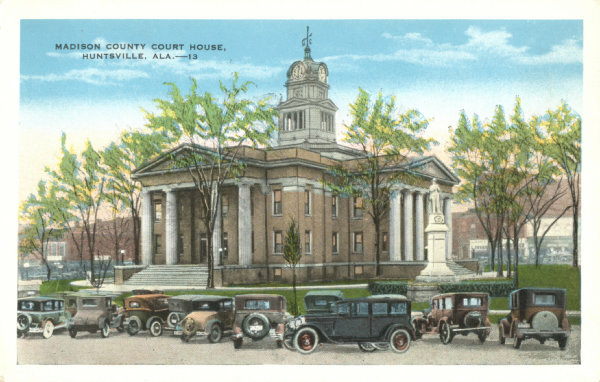 The modern courthouse to your left is the fourth built on this site. 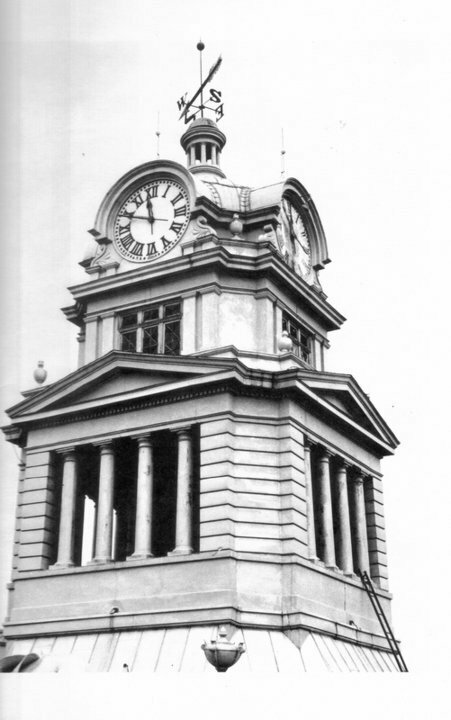 In 1967 this building was dedicated and officially opened. 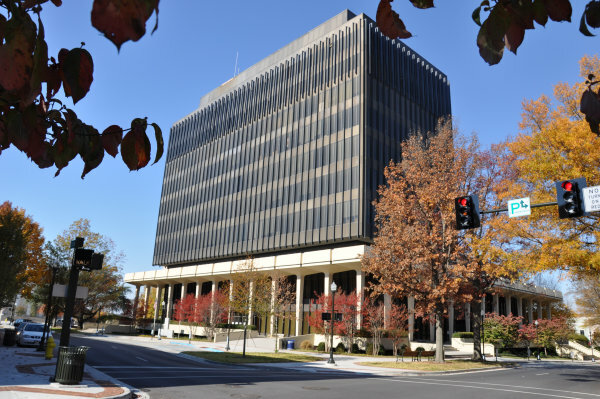 Though it looks somewhat out of place, surrounded by antebellum buildings and homes, city leaders wanted something modern, more in keeping with Huntsville's contribution to space exploration. At the conclusion of World War II, Werner von Braun and his team of rocket scientists surrendered to the United States forces and came to the U.S. to teach their technology to our scientists. The six month visit lasted a lifetime for many of these brilliant men and many of them still make Huntsville their home. 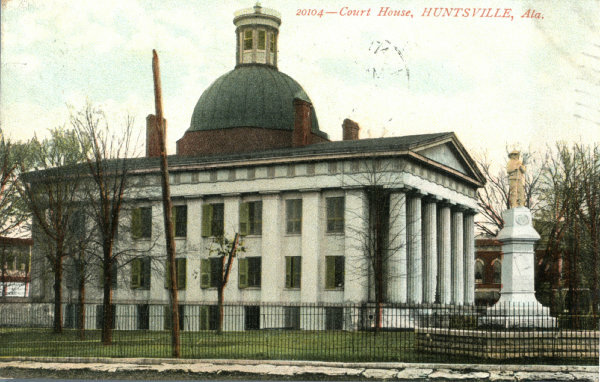 Back: Madison County Courthouse, Huntsville, Alabama. 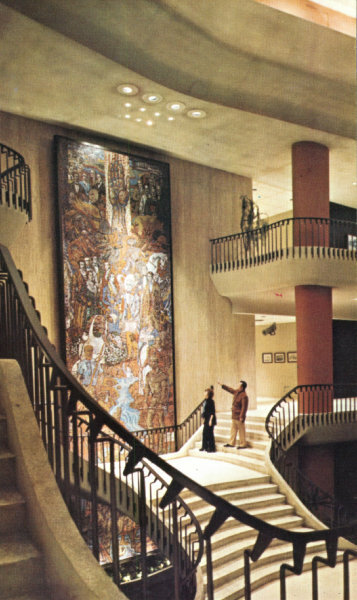 Depicting the history of the county on one million pieces of painted glass. 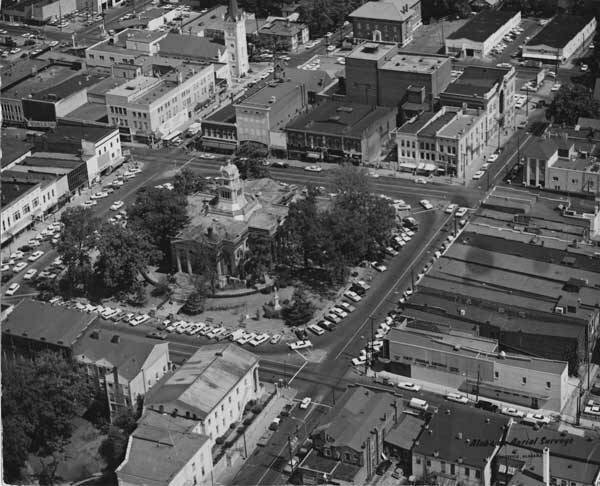 Front: Madison County Court House, Huntsville, Ala.
"Downtown aerial view Huntsville, Alabama, 1964." 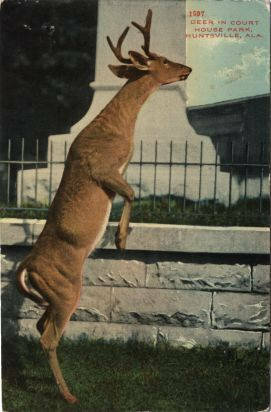 "Deer in Court House Park, Huntsville, Alabama. Postmarked July 7, 1911." 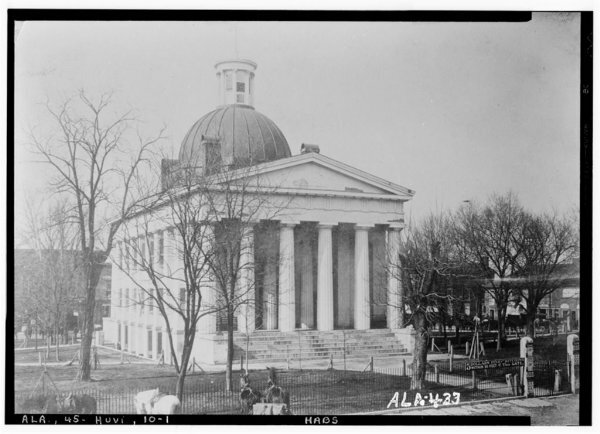 Rights: "Alabama Mosaic; Troy University Library, Special Collections"
Front: County Court House. 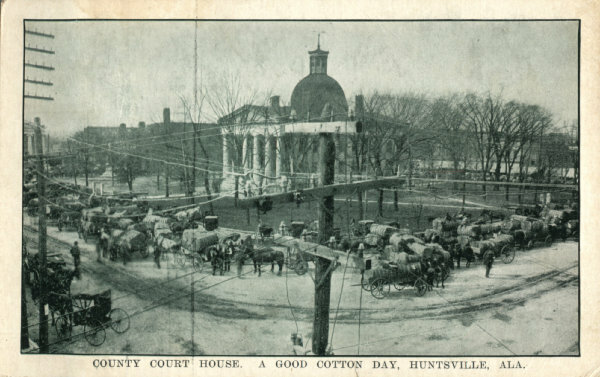 A good cotton day, Huntsville, Ala.
Front: Court House, Huntsville, Ala.
"Courthouse Square, 1864. 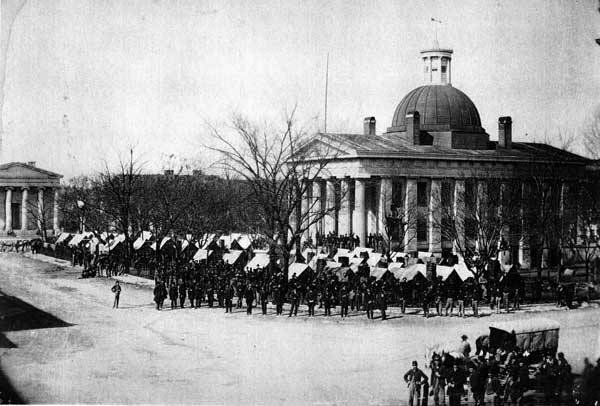 Federal troops occupy the Courthouse Square in 1864. The soldiers reportedly tore down the North Alabama College to construct their winter quarters using brick from the college. 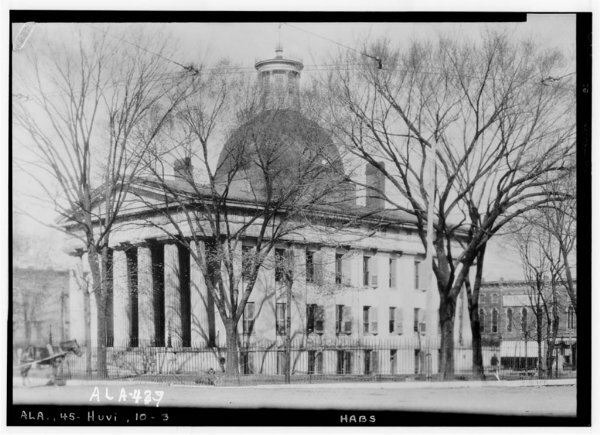 The Old Northern Bank of Alabama is visible in the left of the photograph." "Historic American Buildings Survey Alex Bush, Photographer, May 25, 1935 (COPIED) FRONT VIEW (REPRODUCTION) - FROM E.L. LOVE PHOTO"
"Historic American Buildings Survey Alex Bush, Photographer, May 25, 1935 (COPIED) FRONT AND SIDE VIEW (REPRODUCTION) - FROM E.L. LOVE PHOTO"
"Historic American Buildings Survey Alex Bush, Photographer, May 25, 1935 (COPIED) SIDE VIEW (REPRODUCTION) - FROM E.L. LOVE PHOTO"